The San Francisco 49ers finished the 2017 season with a 6-10 record. Heading into the 2018 season, they are one of the favorites to win the Super Bowl, at +1500. Betting on the San Francisco 49ers might seem like a risky bet but it is not. With Jimmy Garoppolo taking over as the starting quarterback the future looks bright. 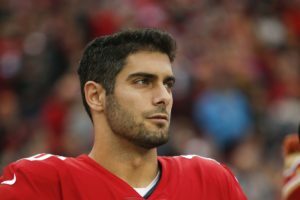 The reason so many people are high on the 49ers is the fact that quarterback Jimmy Garoppolo. He was acquired from the New England Patriots at the trade deadline, led the team to a 5-0 record. With wins over the Jacksonville Jaguars, Los Angeles Rams and Tennessee Titans, who made the playoffs last year. With Garoppolo signing a long-term contract during the offseason. The 49ers didn’t have to take a quarterback with their first pick. They used the pick to address one of their biggest concerns, their offensive line. 49ers believe they have their quarterback of the future in Garoppolo, they still have a few issues to fix. Before they can honestly be considered contenders. The 49ers let Carlos Hyde walk as a free agent, and picked up former Minnesota Vikings backup running back Jerick McKinnon, an undersized running back with 14 starts in four seasons. McKinnon is expected to flourish in head coach Mike Shanahan’s offense as a receiving back, but the team still needs a bruiser that can get the tough yards up the middle. San Francisco’s biggest offseason acquisition was former Seattle cornerback Richard Sherman, who is coming off an Achilles injury and likely won’t be as good as he was in Seattle. Linebacker Rueben Foster’s legal situation is also something that will have an impact on San Francisco’s success this season. If he is convicted of the charges he is accused of, general manager John Lynch said the team will release him. Ff that happens, the team will lose one of its best defenders. The Los Angeles Rams going into Super Bowl or bust mode. Also, the Arizona Cardinals expected to be better. The 49ers probably won’t finish better than 8-8 this season.